GOOD DAY, SUNSHINE: It’s really no surprise that reggae rockers tend to congregate around Santa Barbara. Our laidback beach culture and collective penchant for taking things as easy as possible practically demands it. And while I myself will openly admit to not being the genre’s biggest supporter (sharing so many walls with so many die-hard Marley fans will do that to a girl), there are a select few reggae outfits I can definitely get behind. On the S.B. front, my enthusiastic thumbs up are wagging at Sunshine Brothers. 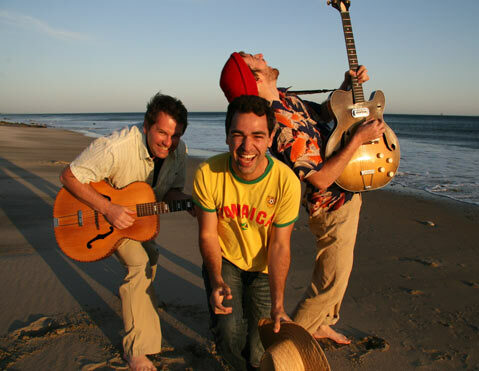 Formed in 2004 by Jamaican-born lead singer Owen Plant, the Brothers have been gaining some serious steam since dropping their debut full length, Live By the Sun, last spring. Now firmly rooted in town, the seven-piece have been keeping busy playing shows all around town, including a couple jam-packed dates at SOhO. Most importantly, the band’s infectious mix of Jack Johnson-y pop melodies, Rasta riffs, and Jimmy Buffett’s sun-soaked party-loving attitude add up to something that is decidedly Santa Barbaran-without sounding forced, cliched, or ripped off. Combine that with the guys’ fun-loving, dance-worthy live shows, and it’s no wonder Sunshine Brothers have become synonymous with having a good time. This weekend, the band will likely win over a few new fans when they head up to the Santa Ynez Valley to play a benefit concert at the Solvang Festival Theater (420 2nd St., Solvang). The show, slated for Saturday, May 23, at 7 p.m., will help to raise money for both Arts Outreach (a nonprofit dedicated to promoting and maintaining arts programming in and outside of the classroom) and The Family School (a private preschool through fifth grade academy that nurtures students’ critical thinking skills and creativity). Opening the show will be SoCal ska dynamo Chris Murray and his band. For tickets and info, call 688-9533. WEEKEND WAILERS: Starting this week, fans of a good vocal thrashing should have plenty to look forward to, with Killola making their big return to Muddy Waters Cafe (508 E. Haley St.) this Thursday night. For those who have yet to experience Killola live, lead singer Lisa Rieffel has made a name for herself as one of the rising stars of the modern grrrl rock movement. Mixing the high-pitched, ¼ber feminine vocal stylings of Save Ferris’s Monique Powell and Tragic Kingdom-era Gwen Stefani with some truly cathartic scream sessions, Rieffel commands attention the way a frontlady should. The band’s new album, I Am the Messer, currently is available for free downloading at myspace.com/killola, and for a live dose, head down to Muddy Waters at 8 p.m. this Thursday. Kristeen Young will open the show. Call 966-9328 or visit myspace.com/muddycafesb for details. On Sunday night, one-time Velvet Revolver frontman, current Stone Temple Pilots ringleader, and former substance addiction poster boy Scott Weiland will bring his newly cleaned-up solo show to the Majestic Ventura Theater (26 S. Chestnut Ave., Ventura). Touring in support of his second effort, 2008’s “Happy” in Galoshes, Weiland is still sporting his signature combo of tight jeans and gravely vocals on the new record. And while the subject matter is a bit heavier and the packaging is more Dylan than heroin chic, the rock riffs and heartfelt lyrics are still ever present. For tickets and info, call 653-0721 or visit venturatheater.net. GO-GO-GOLETA: No matter what your music of choice may be, it seems this week it’s all about heading north. On Thursday, May 21, Devastating Karate will bring their brand of Long Beach rockabilly to The Mercury Lounge (5871 Hollister Ave., Goleta) for a free show at 8 p.m. Call 967-0907 or visit myspace.com/mercurylounge for details. Also on Thursday, Twiin Productions brings reggae heavyweights SOJA to Isla Vista’s frat house SAE (765 Embarcadero del Mar). For info, visit beachcitytickets.com. The I.V. party continues on Monday, May 25, when the Biko Co-Op Garage (6612 Sueno St.) hosts St. Louis indie punk outfit Bunnygrunt with former Santa Barbara dwellers and current Portland ambient rockers Church . Visit sbdiy.org for details.